MOTU Classics Stinkor: Reversed Forearms? Since the Stinkor reviews have hit the net this past week, many fans have started to notice something a little “off” about him. 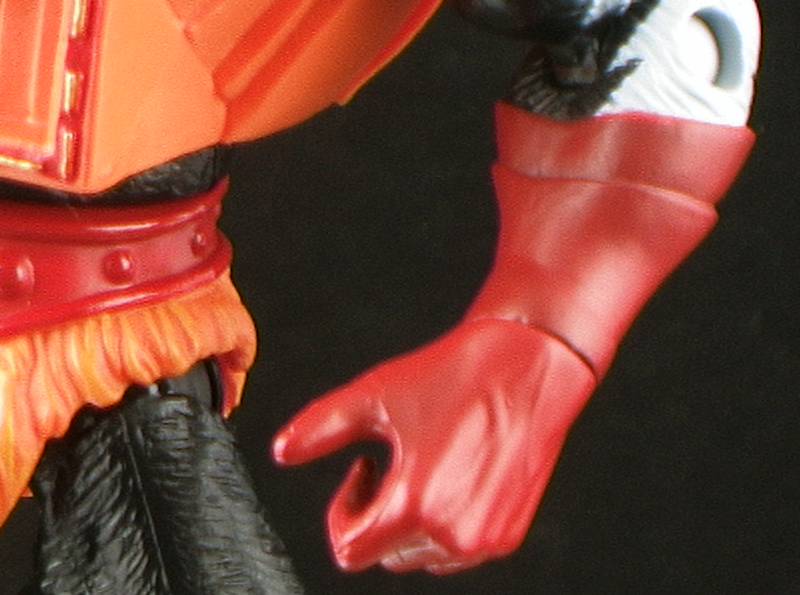 While Stinkor has newly sculpted forearms combining the furry sculpt with the Skeletor “fins,” the fins do seem to be reversed. On Skeletor, Mer-Man, and other figures who have the finned forearms, the fins always pointed more outwards. Stinkor’s point more inward. Because of this, fans were starting to wonder if this was another incident of Mattel accidentally swapping parts at the factory, similar to what we saw with the shoulders on Roboto and King Hsss. While many fans have agreed that it doesn’t seem to be as noticeable on Stinkor, it was still becoming a question that was lingering. So I went straight to the source to see if I could figure out if the forearms are reversed or not. I asked Scott “Toyguru” Neitlich for a comment. So there you go. Official word from Mattel is that they are reversed, but it was done intentionally by design. It still looks weird to me, but It's not going to keep me from buying him. Stinkor was one of four must-have figures for me going into the early days of motuc [the others being Fisto, Webstor and Clawful (and i skipped clawful after seeing him)]. This is different than Battleground Evil-lYn though since her forearm guards can be rotated (so glad they added that swivel). It doesn't matter to me that Stinkor has reversed forearms, just wanted to mention it's not the same as Evil-Lyn. Yeah, you're right. They just added a swivel to the forearm guards on BG Evil-Lyn, making it so you can position them however you wish. So I'm not sure why he used that as an example. Those weren't swapped. Interesting design choice. i don't really think it was necessary, but its cool. Is anyone else seeing all-caps when they try to comment? Unfortunately, I can't seem to figure out how to keep it from looking like that. Still working out the kinks of the site, I guess. 🙂 Hopefully I can get that fixed soon. Sorry! P.S. I use the IntenseDebate plugin for my site's comments. Highly recommended. I will check into this. I wonder if installing that will elimintae all comments already here. I assume it would…but the site is young enough that its not that big of a deal. 🙂 Thanks! Hey There. I discovered your blog the usage of msn. This is an extremely neatly written article. I will make sure to bookmark it and come back to read extra of your helpful information. Thank you for the post. I'll definitely comeback.